The PlayStation App is a software application for the iOS and Android mobile operating systems developed by Sony Computer Entertainment. It allows users to stay connected to the PlayStation Network from tablet and smartphones, and turns mobile devices into a second screen for the PlayStation 4. 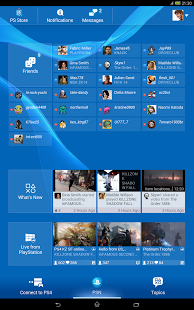 It also provides a news feed, in addition to being able to read and post comments on the PlayStation Blog. The application also allows users to watch embedded videos, and to share news or products on their Facebook, Twitter or email accounts.